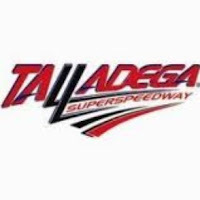 If you ask a NASCAR fan about Talladega SuperSpeedway your going to get a few answers: 1) It's the craziest 188 laps of your life, 2) there's a lot of "Big Ones" and cautions, and 3) anyone can win it at the last few laps. Those are the words of truth, you watch this race expecting it to be like all the others, yet it comes out and shocks you like no other race. We get up early on Sunday morning's and grab our cereal, or lunch. Turn on the T.V. and grab our phones to tweet what is going on, each fan tells who they are cheering on and then we begin to tweet the madness that is NASCAR. Of course, we all tweet about the national anthem singer to say whether they are good or not. 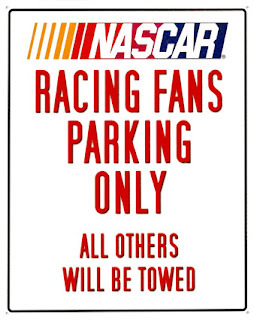 The truth is present that really twitter is a home-base for NASCAR fans to emerge and just enjoy the time together. Well today's race was a heart-racer for sure. Once the engines were fired, the command given, the pace laps done, everyone was ready for the most crazy and intense 188 laps ever. In the beginning all the drivers paired up into the two-car drafting that we saw a while ago. DW and the other's called it "SPEED-DATING" which i find rather humorous, even though when people on twitter talked about it they then got spammed for it. As the race continued on, nothing major happened for a while, just a vast amount of changes and passes. Then Brian Vickers, driver of the #83 red bull toyota ended up having a hard wreck that put him in the garage for the rest of the race. What was about to happen next, made many fans jump up off their feet and go "WOW". THE BIG ONE. At lap 90 multiple cars went flying up, down and all over the place on the track. Many drivers had small damage that could be fixed in a pit stop. As for David Ragan and Kasey Kahne it would end up going to the back of the garage. Ragan had a bit of fire, but Kasey Kahne drove down and his car caught fire and smoked black, thankfully the driver got out and was okay, but very frustrated. Many fans on twitter could not believe the wreck, but were glad to see all the drivers okay. 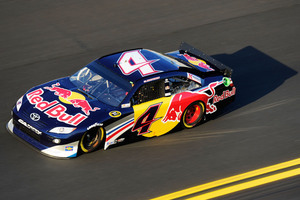 Kasey ended up coming back out and finishing the race and dropped to 18th in points. The rest of the race was all about strategy and trust with your dance partner. Many shocking driver's came up, getting close to the last few laps hoping to get to the end and win, but many came up short. As the last few laps died down everyone was preparing for another BIG ONE. At Talladega it is possible for another one to occur in the last 10-5 laps. Instead of a BIG ONE, we had more of a BIG SHOCK. The winner at Talladega blew away fans everywhere. Who is the winner you might ask? 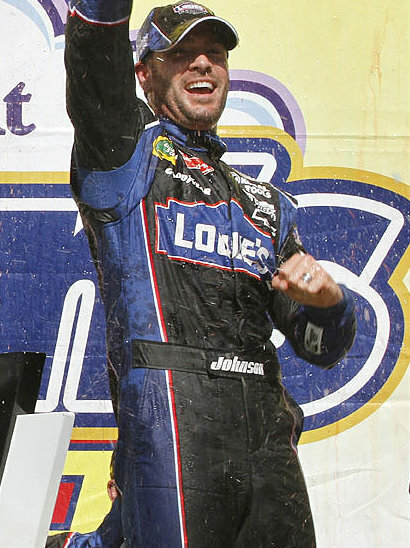 No one else than Jimmie Johnson. At the very few laps, Johnson came down with his drafting partner and was able to beat Bowyer out barley. A shock for many fans who thought Bowyer was gonna rip the win out. Three-wide at the end on that final lap, many thought Gordon, then Bowyer, but it ended up being Johnson. After the race, Johnson drove over and gave Dale Jr. the flag as a way of thanking him for all the help today. Overall the race was as intense as fans had expected it to be, with only a few cautions, the race was keeping fans on their toes everywhere. In my personal opinion i was shocked by the way the race playing itself out from start to finish. my picks were the two red bull toyota's, even though they didn't get top 10's they still worked as hard as they possibly could. I could say in a lot of Fan's points of view that this race was pretty impressive and did keep everyone glued to the T.V. from start to finish. Well this is the last race before we head off to Richmond on April 30th, our second night race of the season! I know I am excited for that race as much as the next fan is. Until next time, i will hope to blog about the next awesome race. Enjoy your week NASCAR fans and until Richmond i will tweet you all and hope we make some awesome picks for the next race. 1) Do you think this win by JJ is going to start a streak of wins for him? 2) How do you feel about the 2 Car Drafting? 3) What do you hope to see in Richmond? Thanks all for reading this!